Management keeps finding new projects to invest in and raising its capital spending guidance for the year. 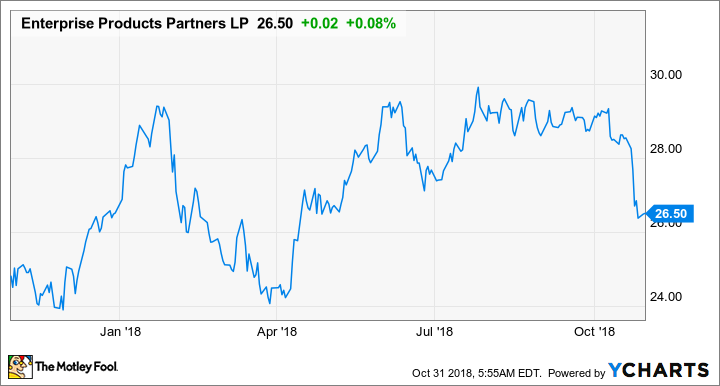 After announcing a slew of new expansion projects and raising capital spending guidance for 2018 in the second quarter, it would have been fair to assume that Enterprise Products Partners' (NYSE:EPD) third-quarter results would have been quiet. That wasn't the case, though, as huge bumps in cash flow gave management more money to invest and announce several new expansion projects. Here's a brief look at Enterprise Product Partners' most recent earnings result and why management keeps plowing more money back into the business. DATA SOURCE: ENTERPRISE PRODUCTS PARTNERS EARNINGS RELEASE. EPS = EARNINGS PER SHARE. All across the board, Enterprise had a magnificent quarter. Operating earnings -- measured as gross operating margin -- were up 61% compared to this time last year, and distributable cash flow was up 49%. While management did note that some of that gain was from a $200 million one-time gain related to some crude oil futures contracts and fair value accounting standards for those contracts, even absent that gain, the company posted considerable gains across all four of its business segments. A large portion of these gains came from five major capital projects that have gone live over the past 12 months, but also because those assets increased the value of its legacy assets. Enterprise estimates that these new assets improved operating efficiency of its legacy assets by $135 million. Data source: Enterprise Products Partners. Chart by author. What happened with Enterprise Products Partners this quarter? For the third time this year, management increased its guidance for capital spending in 2018. Enterprise now anticipates total capital expenditures of $4.2 billion, which was up from a range of $3.8 billion to $4.0 billion. Most of that guidance increase comes from acquiring the remaining 50% equity interest in subsidiary Delaware Processing. The company kept its growth hopper full by announcing several new projects this past quarter. It plans to expand natural gas liquids (NGL) export capacity at its Houston Ship channel facility, construct its 10th and 11th NGL fractionator at its Mont Belvieu complex, and its seventh natural gas processing plant in the Delaware Basin. Enterprise is confident in all of these capital spending increases because cash flow coming in the door is growing at a blistering pace. So far this year, the company has retained $1.6 billion in excess distributable cash flow, a number that is expected to grow by the end of the year. Management stuck to its current distribution growth plan by increasing its payout by a quarter of a penny to $0.4325, or $1.73 annually. This was the 57th consecutive quarterly increase for the company, and it now has a distribution increase streak of 20 years. In the company's press release statement, CEO Jim Teague explained how the current oil and gas market in the U.S. still has lots of room to invest in new infrastructure assets and why management is keeping its foot on the gas. We announced two additional growth projects this morning: a 150,000 BPD [barrel per day] expansion of our NGL fractionation capacity at Mont Belvieu and our Mentone natural gas processing plant serving the Permian Basin. Including these projects, we currently have $6.6 billion of growth capital projects under construction that are scheduled to be completed and begin generating new sources of cash flow between now and 2020. The current environment of strong demand for midstream energy services, coupled with productive discussions with customers to develop new infrastructure projects across all four of our business segments, is the strongest business climate we have seen in recent memory. Our goal is to position Enterprise to capitalize on these opportunities, while self-funding our equity needs to drive continued growth in distributable cash flow per unit and the value of our partnership units. If there were any lingering doubts about management's decision to temper its payout growth rate in favor of investing in growth, Enterprise Products put those concerns to bed for good this past quarter. The amount of cash the company has generated so far this year is fueling an incredible growth platform that could last for several more years. Also, by retaining so much cash internally, it can be much more aggressive than its peers, who still have to rely heavily on selling shares to fund growth. Based on recent investor presentations, it wouldn't be surprising if management elected to keep its payout growth at this slow pace for a couple of years. Management anticipates massive investment opportunities in NGL processing and export capacity over the next three to five years.